Last week, we talked a little about building an audience. Ideally, you should be building an audience months, if not years, before your publication date. But once you’ve got a book ready for publication, it’s now time to start finding book reviewers. Who are book reviewers? Simply put: They’re readers who leave reviews on their blogs, Instagram posts, and store websites like Amazon and Barnes and Noble. Have you ever stumbled across a book you’ve never heard of and checked the reviews to see if it was something you’d want to read? Then you understand the importance of how feedback on websites can help sell books. Now, book reviews don’t always have to be positive to sell books. Tastes are subjective. One person’s cliche is another person’s favorite trope. Of course, if there are ten reviews decrying the editing and formatting of a book, then that’s a different story. But a good mixture of reviews with an average rating above 4* generally bodes well for a book. We spoke at length about the Amazon algorithm in an earlier post, so we won’t rehash that here. The more reviews a book has, the higher it will rank in the algorithm. Although not officially confirmed by Amazon, fifty reviews means a book is included in Amazon’s weekly newsletters, an added, free advertising avenue for authors. Amazon does have some rules around reviewers. Unfortunately, your mom and brother and Great Aunt Sally can’t go to Amazon and say how great your book is. Our alter-ego’s own mother has tried to post a review (of her own volition), and she’s been denied every time. Some new authors engage in so-called “review swaps,” where they read a friend’s book and the friend reads theirs, and they both post a review. This is skirting around Amazon’s TOS, but it’s not a clear violation. However, it’s not a method we recommend. In 80% of cases, you’ll encounter an author who is professional and honest, and will provide an honest review regardless of your rating for their book. But in 20% of cases, you might encounter someone who won’t read your book, or who’ll pan your book if you give theirs an honest review. Paying for Reviews Just don’t. It’s dishonest, it’s underhanded, and it’s against Amazon’s terms of service. Where do I find Book Reviewers? You can search for book bloggers who review books in your genre. 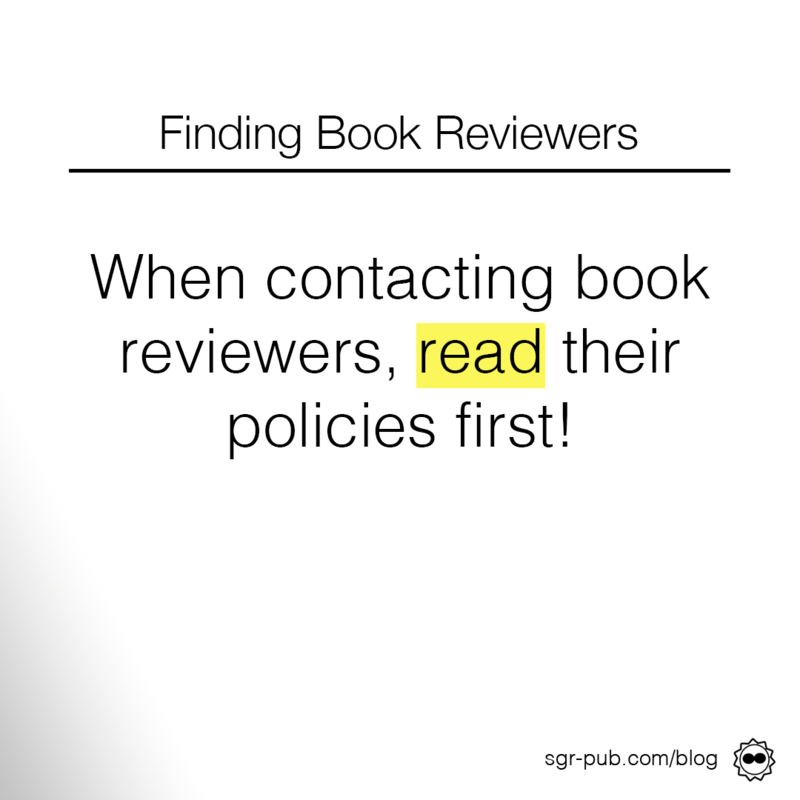 We’ll have a long discussion about book bloggers in a future post, but please follow the golden rule: Read their Review Policies first! A lot of bloggers don’t accept self-pubbed books, so respect that. Ideally, though, you should refer back to our tips in the Soft-selling post. Find bloggers and follow them. Engage, communicate, get to know them as people. Then, check their website for rules around self-published books, genre, etc. And then, if you’ve done all your homework, feel free to pop them an email using their contact information. Don’t be upset if they say no. In the first place, bloggers get bombarded with book review requests from all over the place, big and small publishers. In the second place, they have jobs, lives, families, obligations that aren’t books. They aren’t getting paid for this, so make sure you respect their time. And finally, sometimes they just plain ol’ don’t like the premise around your book. But that’s why you have a bunch of different bloggers to reach out to. And because you’ve been building relationships and talking about your book in non-sale terms, there’s a good chance your blogger friends will already be familiar with your book anyway, and you can ditch the formalities. If all else fails, you can always use NetGalley to put your book up for reviewers to request. NetGalley is the service the big publishers use to upload galleys (advanced copies of books) and distribute to approved reviewers. There are several services you can use to gain access to this for cheaper than NetGalley itself. We’ve had great success with Broad Universe, but some blog tour companies also offer access. Speaking of blog tour companies (which are companies that you can hire to leverage their large network of bloggers to promote your book), they sometimes offer review tours as well. But be careful here: Amazon’s ever-changing terms of service has indicated that *technically* falls under the guise of “paying for reviews,” even though it’s going through a third party, and there’s no guarantee of positive reviews. In any case, your best bet is to build your own network of reviewers.